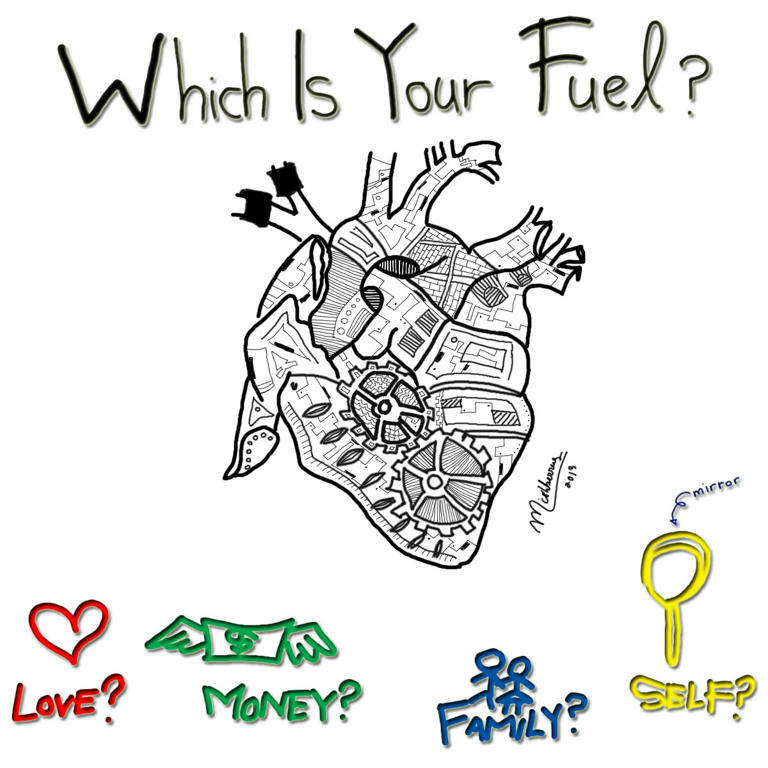 mishberries: Which is Your Type of Fuel?? Petrol? Gasoline? Diesel? Which is your type of fuel that runs your engine? NO LOL, not talking about THAT type of fuel and THAT type of Engine. Last weekend, I met up with an old friend and we got into talking about relationships and personal characteristic, what are we looking for and he said something really interesting. He described it as "her love is what's keeping my engine running" and that got me thinking. I think it's a really nice metaphor to correctly describe a lot of situations that we are in today. The engine that we are talking about here is our heart and the fuel is the driving force behind what's motivating us, keeping us determined and always looking forward. Always reaching out higher with each passing day and trying so hard to just succeed. What's yours? Which is your fuel that fires up your engine? My interpretation of my mechanical heart and my fuel. Done in Photoshop CS3. I gave it a short thought. Love and Family is definitely in the equation but that's not the only equation. There are multiple factors or fuels that keeps a person's engine running. Perhaps it's for money. Perhaps its for yourself. Then I realized, whichever factor you chose, it is not of importance. Important thing is it keeps you looking forward, never wanting to stop whatever you are doing and only giving yourself room for improvement. So what about you? Which is YOUR type of fuel? Behind each of this factor, there's a short story to it. The ones who chooses LOVE as their fuel are usually a person of more sentimental and emotional values who uses ones wit and time to learn new things to satisfy their partner. They would do the impossible if they could. The one who chooses MONEY is usually someone who grew up in extreme environments: They are either pretty rich to begin with, or pretty poor and when they have a chance to make their own money, this motivation usually drives them like fire. Just remember to keep a look out and not let the fire burn you. The one who chooses FAMILY are ones that has very close bonds with their parents, their partners or at times for their children. This is someone who simply wants the best for their family. The one who chooses SELF is someone who wants to prove themselves very hard, very self motivated and nothing is going to stop them from succeeding and making it bigger than what they already have. They are not selfless, they simply has high pride and believes that they alone can make a huge change to their surrounding and make it better. No one is always limited to just ONE factor because only the sky is the limit. If you have more than one of this fuels that runs your engine, you will go a long way from here and most likely than not, to achieve your goals. Do you want to follow each other?? I start now following you with Google friend connect and Bloglovin! Hope you'll do the same!! I wait for you in my blog! Interesting post.. Mine are...God. Family and friends. Books. Writing. Fangirling. I think that's all. Does chocolate count? Amazing!! i love your blog! and your style it´so trendy!! nice to meet u honey!!! i hope see u soon in my blog!!! c.o.c.o. I have a strange kind of engine that just keeps running no matter what I put in it, like I'm one of those cars that can run on vegetable oil or nail polish or whatevs, hahahahahah! Sometimes, for sure, LOVE is a major fuel for me, but sometimes it's the opposite, it just makes it harder for me to function and be creative or generally just think about anything else other than the fact that i'M IN LOVE hahahahahha! I really love your posts! They always make me think! I really don't know if for me is love or family. Couldn't it be the two? I know many people for whom money or self is the way. Not for me. Self sometimes, maybe... I think it's normal that sometimes we put ourselves in front, otherwise people command us. But very seldom I had I put myself first, I think, or I hope. By the way, I just passed an award to you! For me personally it's all of them combined (I know that sounds super cheesy, but it's the truth). If I HAD to choose between one, it would be "love". The second would be "self". I don't mean I neglect family or money, but they just come after love and myself in my motivational thinking. That is a hard one! I think I'm love :) How could anyone really survive without it?! Yea when i have a star love ? I go crazy about it especially when it comes to the hottest guy in Korea.You Know him Song Joong Ki.he is so Pretty and brainy in Running Man Only watch his episodes. I will go crazy of his birthday and where is he from ? He is living In Daejeon!! I have rank in above all the other actors ? Now He is the top 1 in my list ? hope i can find in Korea ?? My engine - is Jesus Christ. Reading His Word and praying makes me the best and humble person that I am today. My success in being a wife, a sister, a friend, a daughter, an aunt, and a future mother is all because of my Heavenly Father. I have been without God for a long time and i was miserable and suicidal, but once I met my Savior I see beauty in everything. I am successful and happy in life like I have never been before. For that I can't thank Him enough! Love this! I was just in a class learning about fuel/motivation, I think a big factor to me is fear. Fear of disappointing myself and others. All four of these options are big motivators for me too. Great post, it's hard to choose just one, but I think love and family! Now for your question, my favorite fuel is GOD. you missed that one :D and Family and Self. This is so cool! I especially love your mechanical heart doodle, it's a great interpretation of the subject :) Did you use a tablet to make it? My fuel is myself right now, because I know I have it in me to accomplish my goals as long as I work hard stay motivated. I know that I can always count on myself at the end of the day to keep me on track. This was awesome! thanks for sharing!!! I think my family, myself, love to my husband and Bikram Yoga to unwind. Another great thought provoking post again. Now it's not me being too lazy to really just think of one, but I genuinely think all four of those things drive me in life and are all intertwined with each other. As you know I don't have a boyfriend but have so much love for my family and friends and that drives me to be the best person i can be for them. At work money drives me so that i can do all the nice things in life that I want and support my family if needs be, which brings me on to family. I don't have kids, but I want to make my parents proud as they have done so much for me and finally ultimately it's me (self) who has to push myself to do all of the above and more! If you like what i wrote, i have post the second part so come on and read it, tell me what you think!! my fuel has to be love, I moved to a different country to be with the person I love! to me, my fuel is love!! you have really great post that got me thinking and reflecting about myself! i guess without love, you wouldnt have all the other fuel at all! It's defo love for me. I'm kind of pathetic when I'm in love, ha! I love surveys like this!! there's a book called the 5 Love Languages that I think you would be fascinated with. Explains all the different ways people love. ohh I love survey type things like this. I have to say for me, all of those drive me. If I had to choose one, it would be either self or love. I think I am pretty self motivated when it comes to things such as school assignments or chores, but love can also make me really motivated. I love that drawing you made because it illustrates everything perfectly. Mmm... I think you must be busy studying! I hope you are fine! I would chose love and family. Seeing my family happy and accomplishing their dreams, hopes and wishes gets me on an unbelievable high. It's the equivalent of drugs. Although, lately, they seem to be suffering, so I've been really 'de-fueled' as of late. I would also add, films. I know this sounds crazy, but I have a burgeoning passion for films and cinema. They are like my addiction. A great film that inspires me and moves me really elevates my soul. I know, I'm wierd. I think my main fuel is my family, I don't know what I would do without them, honestly. Other fuels for me are music, literature, art and philosophy. Also, one thing that particularly fuels me is the desire to engender change in the world and at least try to contribute to making a difference in terms of our environment and what we are doing to our planet. Again a super interesting entry!! The first thing I thought was "SELF" and only that... but that's really sad and then I thought that my family and love are also very important to me. Your mechanical heart drawing is awesome!